The full collection of books is available at the University of Maryland, Baltimore’s Health Sciences and Human Services Library for check-out to those affiliated with the University System of Maryland and through inter-library loan for all others. Books may be purchased from a book retailer or publisher. Please note that the availability of books for purchase may be subject to change. Recommend a children's oral health book? Send a comment or make a suggestion? Receive a notification when content is updated? Share with us & others how you have used the booklist, this subject guide, or specific books on the list. You can also send us your related tweets, newsletter mentions, photos, etc. Together we can educate children, their caregivers & the health professionals working with children about the importance of good oral health & reading, too! Dental caries (i.e. tooth decay) is the most common chronic children's disease in the Untied States. 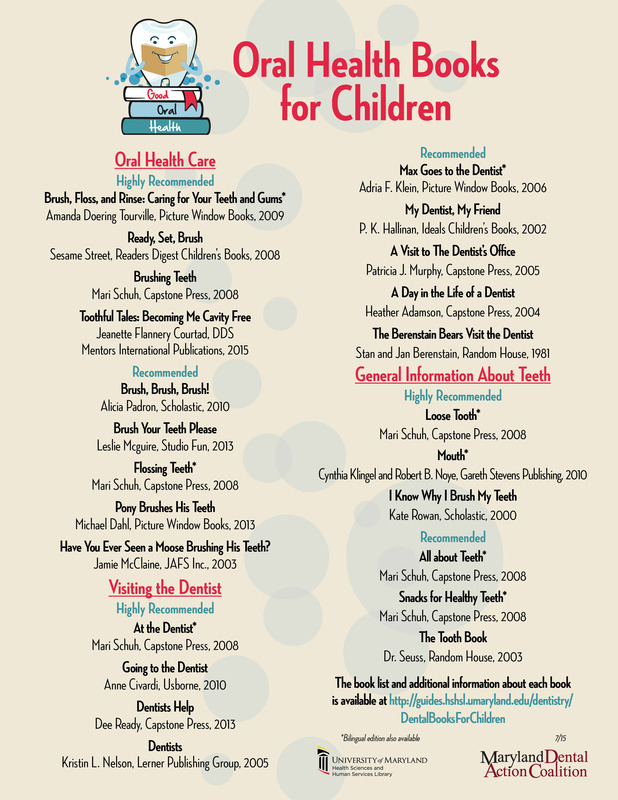 To increase access of oral health information to children and families, and to provide guidance to those who purchase books, a list of oral health books for children (under the age of seven) was developed by an interprofessional group of reviewers for use by pediatric dentists & dental hygienists, pediatricians, nurses, librarians and early childhood teachers. An interprofessional review team was created with representation from dentistry, dental hygiene, nursing, public health, library services, and education. The team created an evaluation tool that was used when reviewing the books. 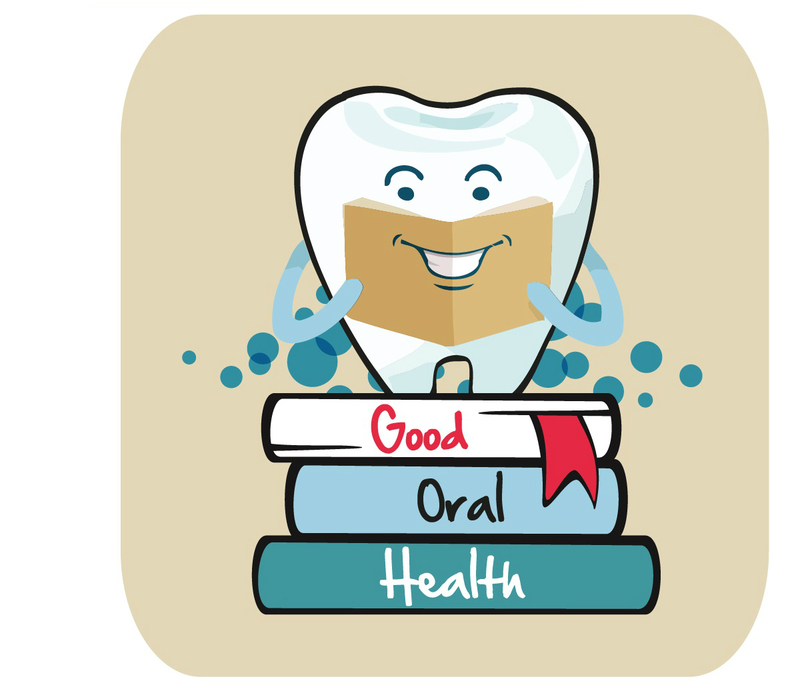 Over 30 criteria were developed including general book and content-specific oral health components. Each reviewer also completed an overall assessment of each book. If you would like to print a copy of this list, several formats are available:1) 8.5 x 11 single page flier/handout, 2) Bookmark - two per page, 3) Bookmark- oversized. A very special “thank you” to the Interprofessional Review Team who volunteered their time to this project. Sincere thanks to the DentaQuest Foundation for their support. Gratitude to the staff members of the Health Sciences & Human Services Library (especially Patrick Waugh & Thom Pinho) and the Maryland Dental Action Coalition staff & members whose help was invaluable. Special thanks to Dr. Diana Capobianco for providing the review team with space to meet at the Bel Air office of Growing Smiles.